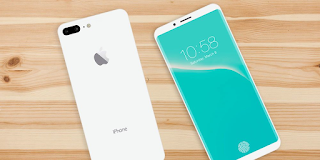 Apple planning to launch iphone 8 this year end because 2017 will be the 10th anniversary of the iphone and Apple planning some thing major to launch on this occasion. Already strong rumors saying that major improved features coming in the 2017 iphone. Apple already testing 10 iphone prototype models which means Apple plans something big this time strick the market with iphone on 10th anniversary. Rumors suggest Apple redesign iphone display with bezel-less display where finger print sensor is inside the display means no more Home button. iphone 8 will be a single glass sheet with improved force touch screen with built in finger print sensor and camera sensor. New iphone 8 screen featured 5.8-inch OLED display like Samsung Galaxy S7 and curved from both sides. The iphone 8 came with improved IP68 water and dust resistance rating. Also rumors about Apple might drop a Lightning port and adopt USB TYPE-C port. This mean you are going to get super fast data transfer with fast charging iphone battery. iphone 8 expected to have new A11 chip with 3GB RAM, 64GB to 256GB NAND flash storage and next-gen wireless charging built in. In addition iphone 8 could include iris scanning.